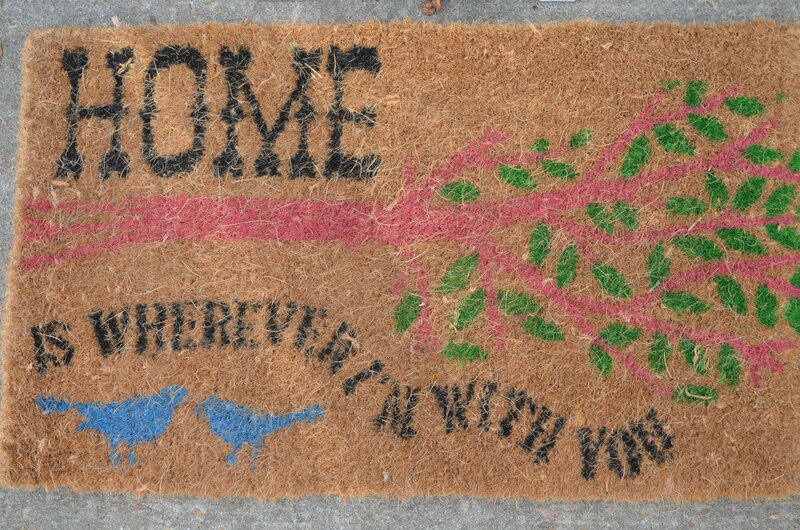 They also sell door mats, which Colin purchased before our trip. I think its a nice touch! We have called our little camper home for 5 weeks today. After driving 4,959 miles we have decided to take a day and get some housekeeping done; reorganizing the camper and truck, cleaning, catching up on the budget, and giving you a tour of our lovely home. All of this is happening from the backcountry in Death Valley N.P. in California. We’ve got clear blue skies and FULL SUN. Yes! 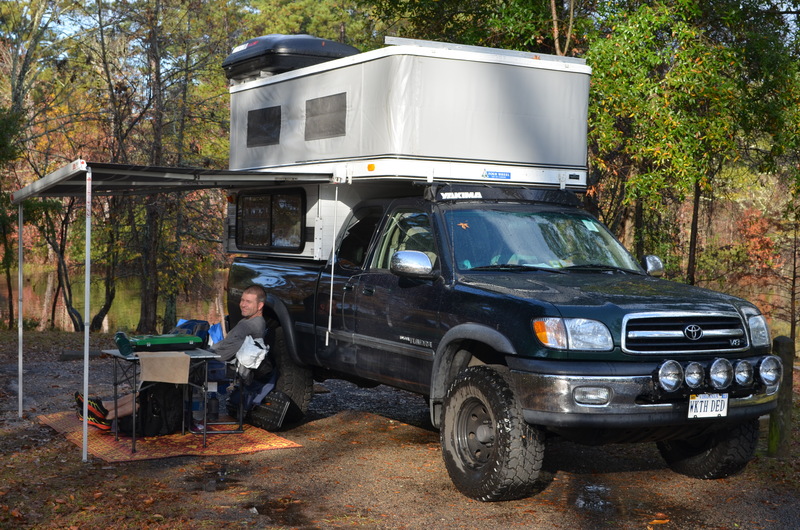 Our home consists of a 2002 Toyota Tundra and a 2008 Four Wheel Camper Eagle. Back in Jasper Texas, our Fiamma Awning was a blessing during a day of on-again-off-again rain. Moving on to the cozy inside…check out that full kitchen. Complete with a propane 2-burner stove, cabinets, a sink used only for storage (an option we could do without because it uses precious space), Engel 2-way refrigerator (a must!) and look at those cute little cactus salt & pepper shakers (thanks Jan & Robert). The roll-over couch has plenty of room for two and lifts up to reveal more storage underneath, all necessary wiring and dual auxiliary batteries that power our lights, refrigerator and heater (when it got to 7 degrees one night at the Grand Canyon, we clicked on the heater and were so happy to have this option). 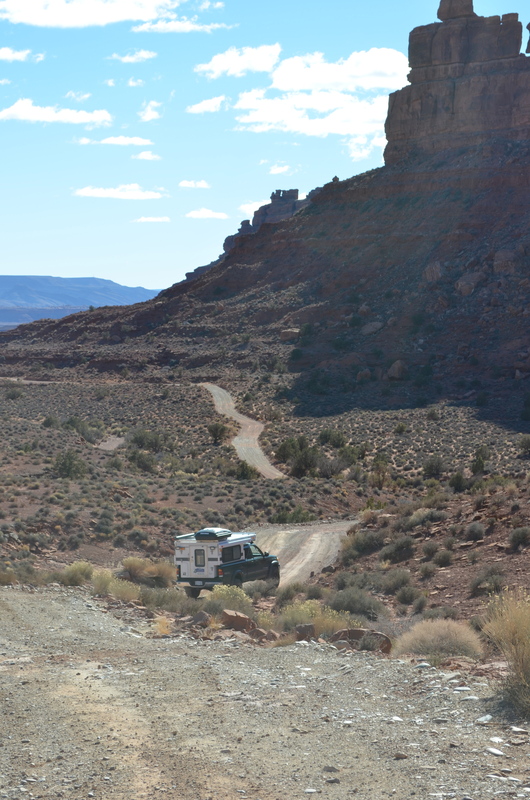 A solar panel up top provides a bump to those batteries allowing us to camp off the grid. When we pop the top the ceiling height is 6’4″. We chose the pop-up version instead of a hard side model because we like having a low profile for driving. The problem we are facing is the load, and trying not to bust our backs when lifting it up (we had the same problem with the Syncro). Our wish list has “Gas Strut Roof List Assists” written in bold with stars. The upper loft is one of my favorite rooms in the house. It has a full queen size bed which means room to roll around and kick my legs out (which I do several times in the night). We’ve added a foam pad for extra comfort. Here is our fancy drawer system. Found for $25.00 at Target. Please note in the picture, those gas cans are empty while we work on finding a swing-away carrier. Dinner for two, please. 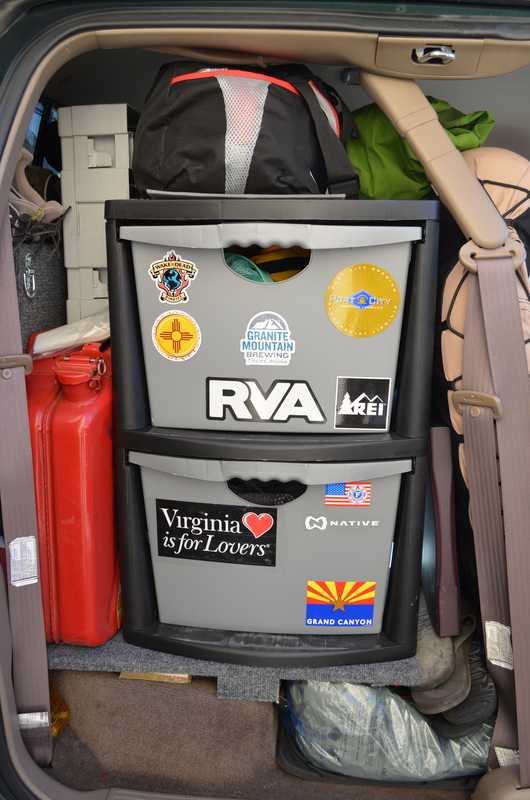 Check out my staging skills (I hope you noticed the same in the camper…what you don’t see in the interior shots is the large pile of gear stored on the floor while driving). 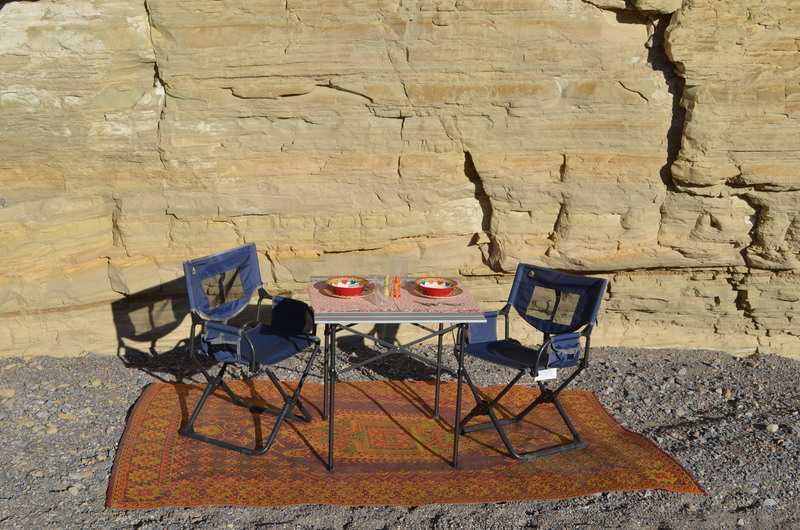 The table and chairs were purchased from REI – we love them and use them every day. They fold up and out with no trouble. The rug from Madmats pulls the whole scene together quite nicely (made from 98% recycled plastic). 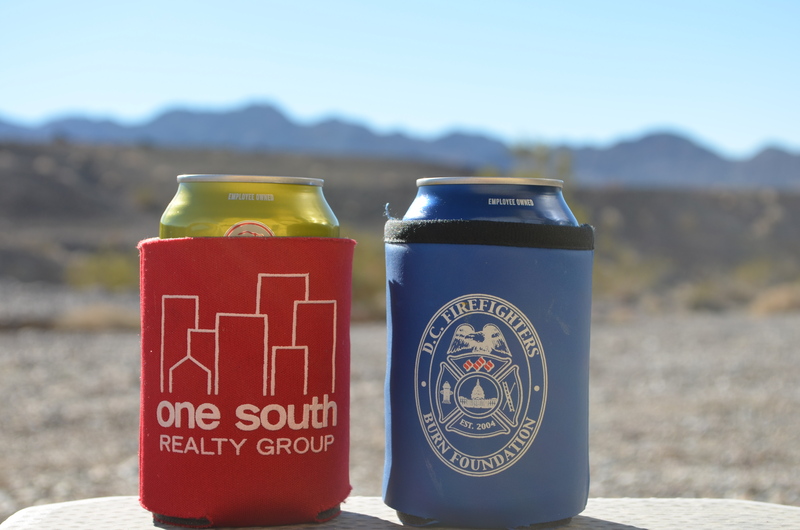 Speaking of staging…take special notice of our favorite beer koozies (used only occasionally). Shameless shout outs to the D.C. Firefighters Burn Foundation and One South Realty Group in Richmond, Va (Hi Guys!!). 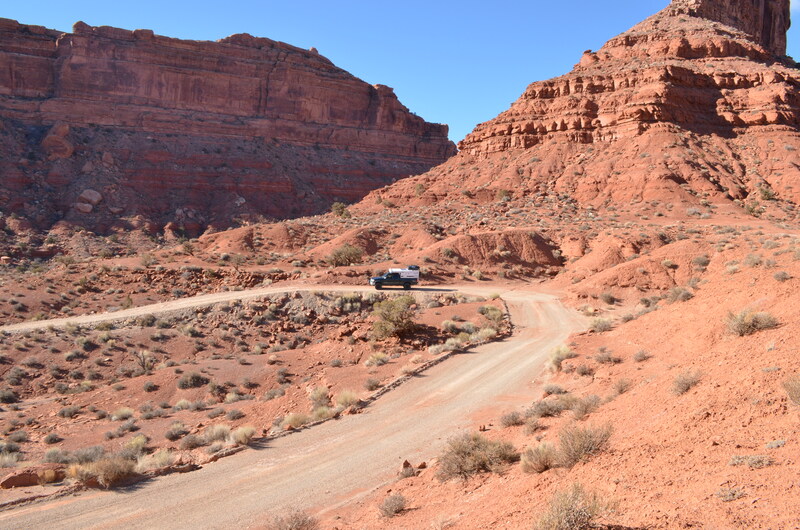 While in the Valley of the Gods (a blog post coming soon on this spot), I cracked a joke at Colin’s expense and shortly there after he seemed very eager to have a picture of the truck next to these massive buttes. He asked if I wouldn’t mind getting the shot. He starts to drive away and I’m thinking he wants to me take one of him going farther down the road. But then he keeps going…. For anyone considering a Four Wheel Camper this section is for you! 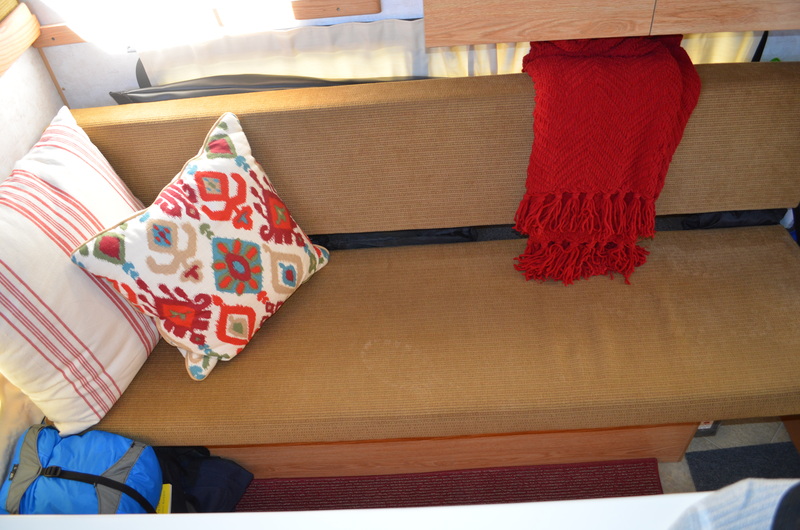 We wanted to share a list of things we love about our camper and a few options we wish we had. Remember, you can start with a base model (or a shell) and make it your own by choosing from several options FWC offers (see website here). *Size – It is the perfect size for two people and a small dog. Fits really well on our Toyota Tundra with little overhang in the rear and zero on the sides. 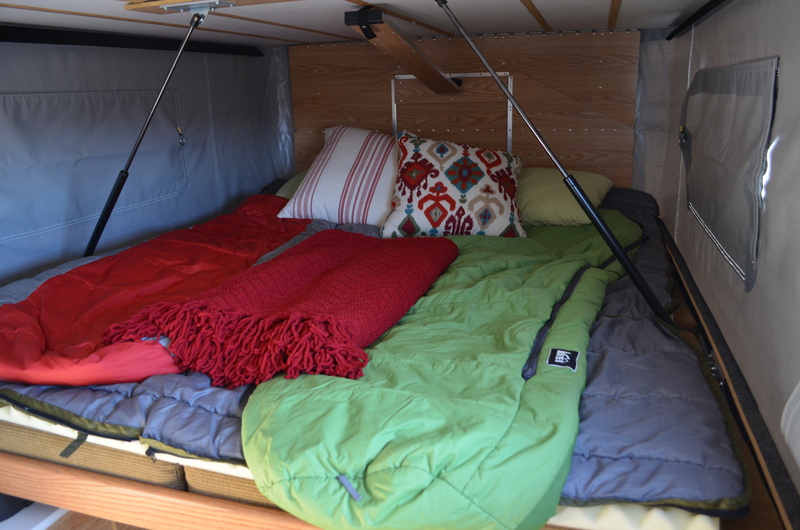 *Weight – As far as we know FWC makes the lightest slide-in truck camper. This is very important to us because of the gear we also pack and our truck carries the weight with ease. 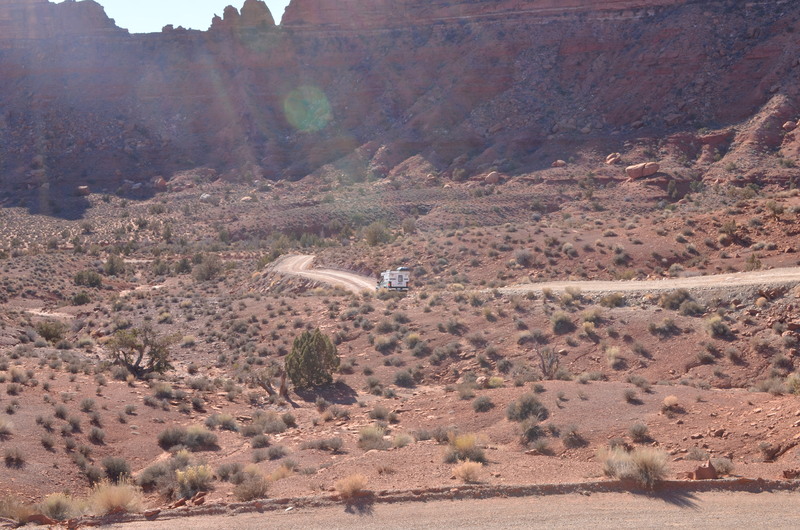 *Solar – Our camper came with 85 watt panel which allows us to camp off the grid for days at a time. *2 Way Engel Refrigerator – Love it. It’s quiet and seems to draw minimal power and a good size for us. *Fiamma Awning – Since our inside living area is tight this adds to our comfort and outdoor space. Easy to deploy and roll back in. *Side & Rear Exterior Lights – We find ourselves using the side lights often while cooking outside after dark. The rear lights are good for as Colin would say, “those little things that go bump in the night.” Would be nice if they could double as reverse lighting. *Fan-Tastic Fan – Provides great ventilation for cooking inside, cooling and drying things out. *Propane Heater – A lifesaver on those cold nights. *Adequate Storage – Of course we would like to add more (we would consider taking out the sink and water tank & would love to have storage under the bed). *Queen Size Bed – Perfect for us and room for the pup. *Screen Door – Keeps it bug-less and breezy. *Inverter – We added this but a great option that FWC offers. 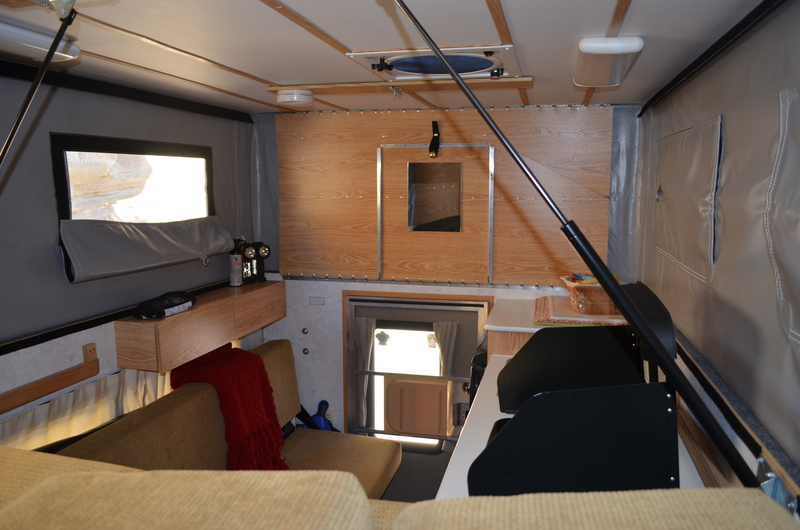 *Thermal Package – Easy to install and helps to insulate camper. *Level Indicators – Kinda nice when your not sure! Options we wish we had and a few things we would change. All but the last 3 items on this list are available options from FWC (check their website for a complete list!). *Gas Strut Roof Lift Assists – A must for having several items on the roof. We have a solar shower, solar panel and a Yakima Box. This makes it very difficult to lift without the extra help. If you are going to add a roof rack, chances are you are going to load it with something…get extra stuts! 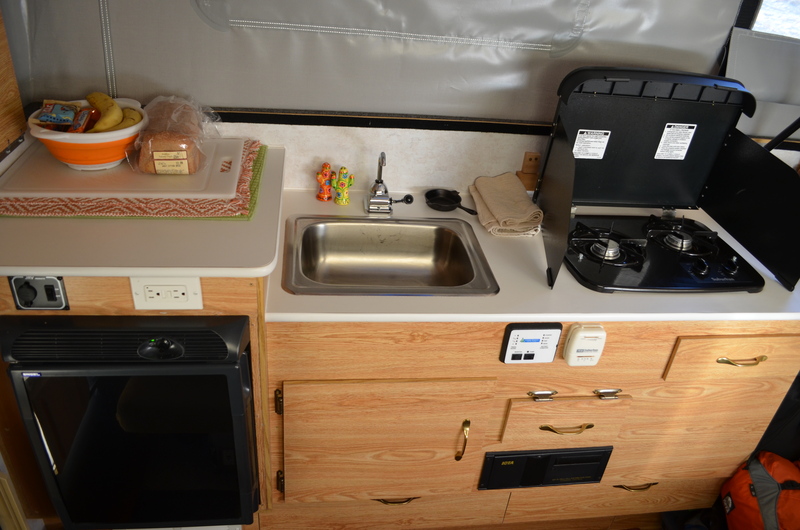 *Layout – We would like to see the stove top switch spots with the sink so that the bed can be out while using the stove. In our case, Colin wants to sleep while I am ready to start coffee. *Hardware – The new models have much improved hardware and we wish we had it! *Soft Sides – We think this should be a breathable material since we have noticed a lot of interior moister due to condensation. *Trim Pieces – The trim pieces running along the inter ceiling are now warped due to the condensation. We would like to see a different material that is more durable. *Insulation – More lightweight insulation all around. One final thought: If you can swing it, get a good swing-away carrier. 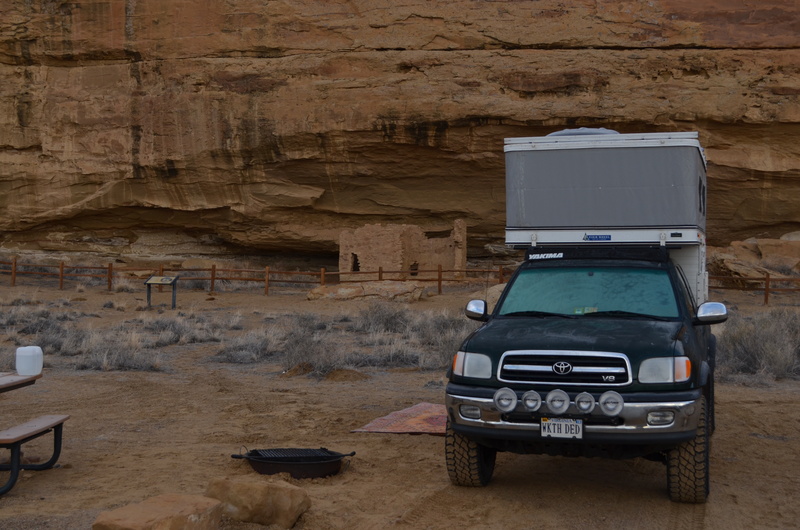 Aluminess makes a good product that is compatible with Four Wheel Campers. Then maybe you won’t be stuck carrying fuel and water cans inside your truck. Time & budget have prevented us from making this purchase. Please feel free to contact us if you have any questions about our rig and we will do our best to answer them or point you in the right direction. So far. So Good. Many more miles to go (hopefully!). Keep on trucking you guys! So good to be in the news!!! Your needs. Our skills. One South. America – Home of the Brave?